Pauline Petinaud (Sista P) was born in Kingston, Jamaica where she lived until migrating to the U.S.A. to join her family, further her studies and pursue a career as an accountant. 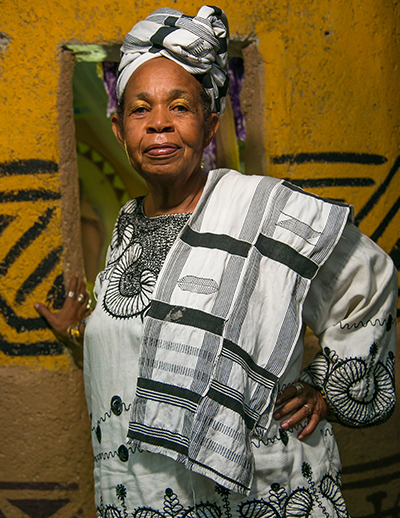 While there, she became aware of the struggles of African people worldwide and gained extensive knowledge of their culture through the arts. After 14 years, she returned to Jamaica in a top management position with Intercontinental Hotels in Montego Bay. It was in that position that she saw where Jamaicans were moving away from their traditional ways while acquiring foreign attitudes. For the past 30 years Sista P as she is affectionately called has been living in Portland where she has dedicated her time to preserving Jamaica’s traditional culture and heritage, improving literacy, exposing Jamaicans to life on the continent and has attained the status of Cultural Ambassador among her peers. As the Jamaican representative and Board member to PANAFEST (Pan African historical theatre festival) the largest festival of its kind held in Ghana bi-annually, she has made several trips to Ghana, Togo and Benin. Her trips have been so popular that over 100 Jamaicans have accompanied her including lawyers, doctors, teachers, politicians, musicians and farmers. The Content Model School an Afro-centric educational institution which she built for her community, Content District that sent the first set of students from the community to attend high school. The Content Model School Drummers who won several gold medals in The Jamaica Cultural Development’ s performing arts competitions and performed in the USA, Africa and Trinidad. The Nayamka Drummers who were the first Jamaican group to win the coveted World Champion Trophy at the World Championships of the Performing Arts held in Hollywood, California 2001. Jamaica Tourist Board representative for culture at the Rottotom music festival in Italy. Contributor and occasional host of Irie FM’s Running African program. Contributor to “Inside the Village Square” radio program in a segment “Yard View” on WVIP 93.5 FM, New York. * Host of the Spiritual Vibrations program on Stlyz FM 96.1, Port Antonio, Jamaica. Founder and Producer of Fi Wi Sinting the largest Black History Month event in Jamaica now in its 21st year. Managing Director The Fi Wi Sinting Foundation.